I’m super-excited about our newest Cambodia Fundraiser. 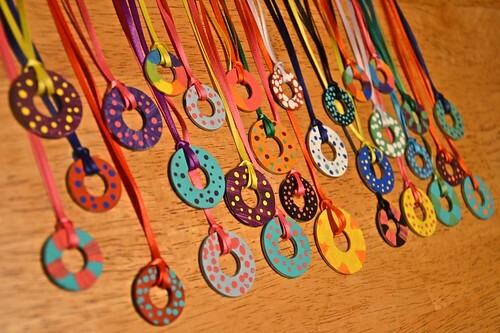 Washer necklaces!! Gabe’s mom called me with the idea a few days before the Art Fair last weekend, and I knew the girls would love making them. We decided to color them up a bit by painting them (in chunks and polka dots) and adding all colors of ribbon. They were a HUGE hit at the Art Fair with the teen girls especially. They snatched them up like crazy. And as a couple people suggested, they would make lovely BOOKMARKS if you’re not someone who likes necklaces much (that would be me, the jewelry-less bookworm). So, necklace, bookmark, wall decor, whatever. Aren’t they awesome?! You know you want some. You will be SO COOL. 1. The necklaces are $2.50 each (or 5 for $10). That includes shipping to a U.S. address. 3. There are 2 sizes to choose from: 1 inch in diameter and 1.25 inches in diameter. 4. I also have some necklaces that sweet Nina painted. How do I put this gently? Let’s just say that she’s worried no one will buy them because she’s “not a very good painter.” If you feel so led, please add a “Nina Necklace” to your order at the bargain price of $1.00. 5. You can also order unpainted necklaces or ones w/Cambodia written on them w/black Sharpie as a reminder to pray for Cambodia. I have about 50 Diapers books left to sell. (see this post) E-mail me if you’d like some. I also found 3 boxes of Blushing Bride in a cupboard in the garage this weekend. So, I have 200 of those to sell as well. Same deal as the Diapers books. I’m getting rid of them once and for all, so this is your last chance to buy cheap in bulk. May flowers bring June weddings! E-mail me with your order. I’d be happy to sign the books for you/your friends if you’d like! Again, all proceeds to the Cambodia Fund. Thanks in advance for supporting us, friends! Happy Monday! Aww, great idea…I love it!! We would love 2 necklaces…my daughter would love one with black on it but you can pick the rest..and 2 Nina necklaces please! So 4 total. If you email me your address I will get the money to you. So darn awesome! 🙂 They are beautiful!